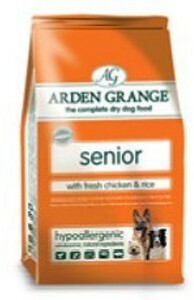 Feeding recommendations: Arden Grange SENIOR with fresh chicken and rice may be fed to adult dogs from the age of 7 years or as required. Chicken Meal* (min 23%), Whole Grain Rice (min 23%), Whole Grain Maize, Dried Brewers Yeast, Beet Pulp, Chicken Fat, Fresh Chicken (min 5%), Egg Powder, Fish Meal, Linseed, Fish Oil*, Minerals, Vitamins, Nucleotides, Prebiotic FOS, Prebiotic MOS, Cranberry Extract, Chondroitin Sulphate, Glucosamine, Sulphate, MSM, Yucca Extract, L-Carnitine. * Preserved with mixed tocopherols and rosemary extract.